To define the American sports car, one has to look no further than the Chevrolet Corvette. For 65 years, the Corvette’s story starts with being different than the rest. Built with a fiberglass body, a performance-tuned suspension, and a mass of horsepower underneath its hood, this is a car that is designed to win on the track and rule the highway. We have written songs, books, and poems to praise its greatness. It is American folklore wrapped in fiberglass. Not everyone had the chance to experience this great car. The chosen few have been drawn to the badge of the crossed flags. These privileged drivers fitted themselves in the cockpit of America’s sports car to experience the driving dynamics and outright power it is known for. Then, there’s the rest of us. We sat on the sidelines dreaming of the day we experience what the Corvette is all about. We waited six generations to get there. In its seventh iteration, the moment has arrived—and it is good timing. Not only has the seventh generation Corvette been called the best ever; it is now on par with the world’s greatest sports cars. Our timing was right. Like you, we always wanted a turn in a Corvette. The first thing to know about the Corvette is the continuity of design through revolutionary changes. The formula has been practically the same since 1963 and the second generation model: long hood and fastback styling for the coupe models. For convertibles, it was a short deck out back. 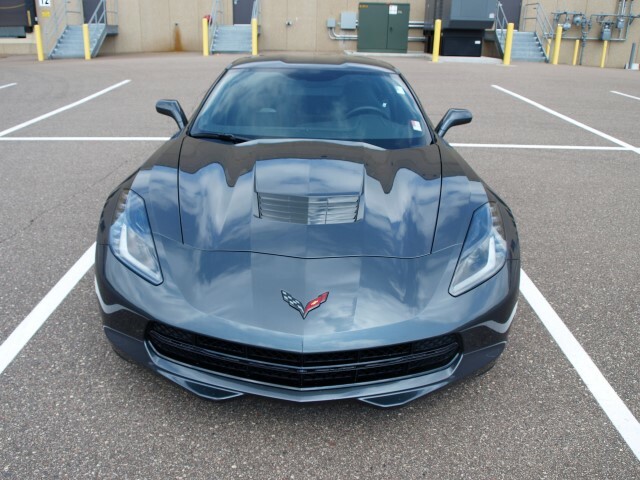 When the C7 was introduced in 2013, it showed not only a progression from the basic design idea, but an emphasis on modern aggression: a teethy grille up front, multiple-bulb headlamps, a front-opening hood with massive airflow vents, a fastback with a first-time-ever pane of glass aft of the door, and a new take on the four-lens tail light. With every line, a crease or fold would accentuate a new muscle. This is a Corvette with a mission to play on an equal level with the greatest sports cars ever made. The design of the seventh-generation model is memorable and befitting of its mission. While the exterior nailed this mission spot on, the interior was given equal consideration toward that end. Given its competition, the Corvette’s interior was stepped up to meet its goals. The materials are much better than before with a bigger readout for the instrumentation and necessary vehicle information. To the right in the center stack is the MyLink infotainment screen, which is actually tactile with key switches and knobs at finger’s reach. All other switches are corporate General Motors ones, which is not a bad thing at all. In fact, the Corvette is a very easy car to operate. You only get two seats in a Corvette, sitting low toward the ground. The ones on this tester offered deep bolstering that locked you in tight. The seats will remember your body after a while, so fatigue is countered if a long journey is necessary. For a short blast on a track, these seats are perfect. 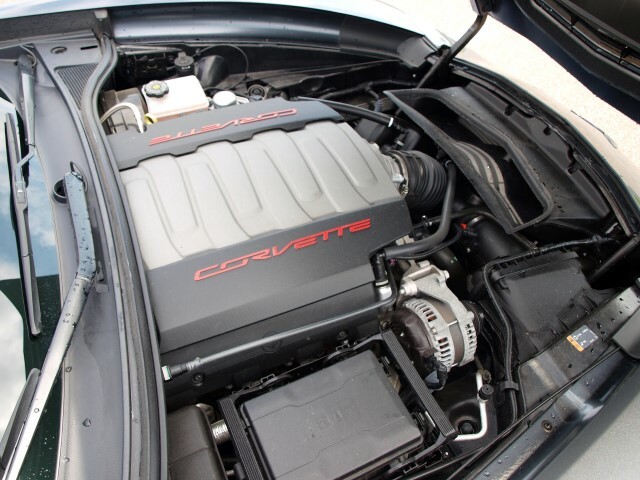 The heart of a Corvette is its Small Block V8. Stingray customers get the 455-horsepower standard 6.2-liter engine. With direct injection and active fuel management, do not be surprised if your fuel economy average is higher than expected from a car of its caliber. We saw a wide average between 20.5 MPG and 25.3 MPG with the 8-speed automatic transmission. The key to fulfilling the Corvette’s mission is the right setup. The knob on the console closest to the driver is how that car is configured. The Drive Mode Selector offers a variety of setups ranging from a touring mode for chill-out driving to sport for better steering, suspension, and throttle response. Track mode offers the ultimate experience with everything set up for high-performance driving. There is also a weather mode that manages the Corvette through wet conditions. Switching between touring and sport modes, the Corvette offers a superior driving experience. You do feel the car; it rumbles, roars, and sends a pulse up and down the chassis and body. Handling is extraordinary with flat-out cornering and superb grip from the Michelin Pilot Super Sport tires. Brakes grab perfectly in both normal and panic stops. The steering is exemplary with nominal play on-center and excellent turning radius. Response at the wheels is sharp and exacting. What will surprise many people is the ride quality in a Corvette. The C7 was designed to offer smooth and absorbent feedback from the road, regardless of condition. You do not feel rougher road conditions due to perceived firmness from the suspension, even in sport mode. Touring makes it even softer and absorbent, but not too soft. All of this point out to one thing: driving a Corvette is very easy and anyone can do so. Even someone who has never driven a Corvette or any sports car…supercar…hypercar..and so forth. A new 2018 Stingray starts at $55,495. There are two other models available: the Grand Sport and the Z06. The latter has a supercharged version of the same 6.2-liter V8, good for 640 horsepower. 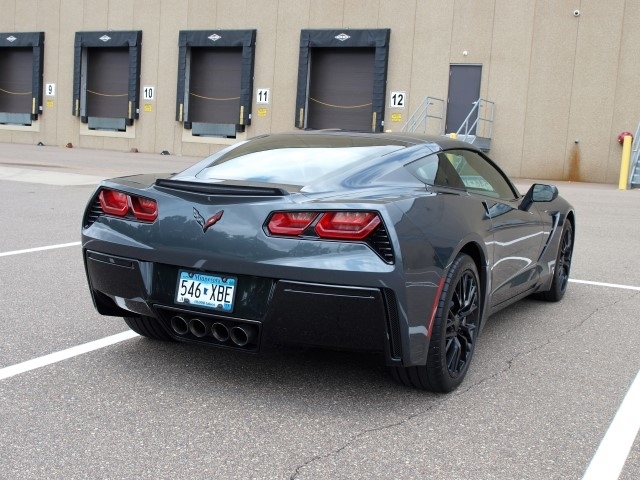 Something we did not mention about this review is that we did not drive a brand new Corvette. Instead, our tester was a 2014 Stingray 1LT with over 10,300 miles on the odometer. This drive offered the exact same characteristics as if we were to drive a brand new model. It brings up an important piece to the sports car puzzle. Only a few can buy one brand new. When they do, they are indeed limited by our climate to fully use it year round. For about five months out of the year, “average” use may be as limited for just weekend drives. Most sports car owners in our readership area usually buy one as a second or third vehicle. When sports car owners trade or turn in their beloved rides, they enter in a very specific sports car pre-owned marketplace. For starters, one will find lower-than-usual mileage on these cars than your average daily driver. Secondly, you will find that a lot of these cars are kept in superb condition by their owners, dealerships, and mechanics they worked with. Lastly, you will find these vehicles sold by experts in the brand or specific model—the latter in the case of the Chevrolet Corvette. Those who know their cars will sell them properly to the right owners. Just like any high-performance sports machine, the Corvette offers a particular experience to the driver. But, having the engine up front, driving the wheels in the back offers a more proper sports car setup enthusiasts would prefer. We understand that this is cause for debate, but we know one thing: to drive a Corvette is a special experience one must accomplish in their lifetime. For this columnist, I waited my entire life to drive a Corvette, until I got to work with this one. Surprised? It’s true. This was my first stint in America’s sports car. And, it was indeed a special experience. 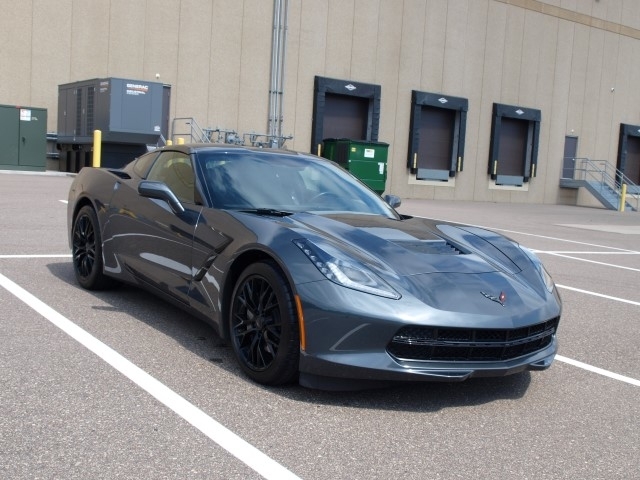 If you want to own one, the C7 is the generation to get. Not because it’s newer. It is because the Corvette simply matches up with the world’s greatest sports car.